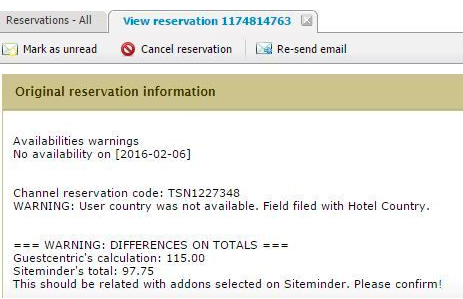 A reservation status is showing up 'with warnings', why? 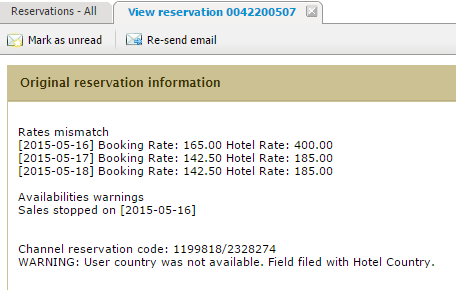 HOME > CHANNEL MANAGER > A reservation status is showing up 'with warnings', why? This scenario usually occurs whenever our Channel Manager detects a discrepancy between the channel reservation and Guestcentric reservation. This can happen whenever we receive a channel reservation with a total amount different than the rate set on guestcentric. Sometimes channels send reservations without tax details, suplement charges, or even apply a direct discount related to an active promotion set directly on the channel side. This usually occurs when we receive a channel reservation for a specific date that is already sold out and/or with sales stopped on the channel manager. The property may have allotment contracted on the channel side, due to the auto-replenishment rule from Booking.com (cancellations will reopen availability only on the channel side). The stop sales is done after the reservation is confirmed on the channel and integrates our system. However, there can be another customer confirming a reservation at the exact same moment on another channel. This can cause the second reservation to integrate in the system as well, before the system closes the availability due to the first reservation.